I frequently hear about people leaving food caches in the backcountry. A few times, I’ve even found caches. That bucket of nails, drink mix, tape, bullets and other survivalist stuff is now sitting in a dump in the central valley. 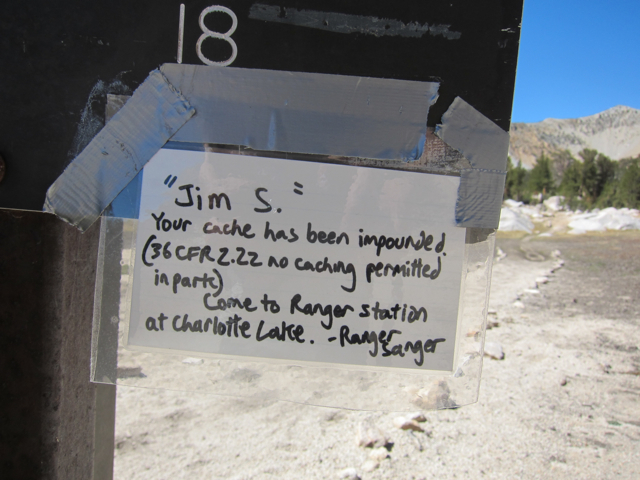 It is illegal to leave caches on most (all?) public lands in the lower 48. This cache was confiscated on the west side of Kearsarge Pass. PITA for all parties. They’ll also confiscate caches left in wilderness bear boxes.